I’m back in town for this week’s DA after my quick sojourn into South East Asia. 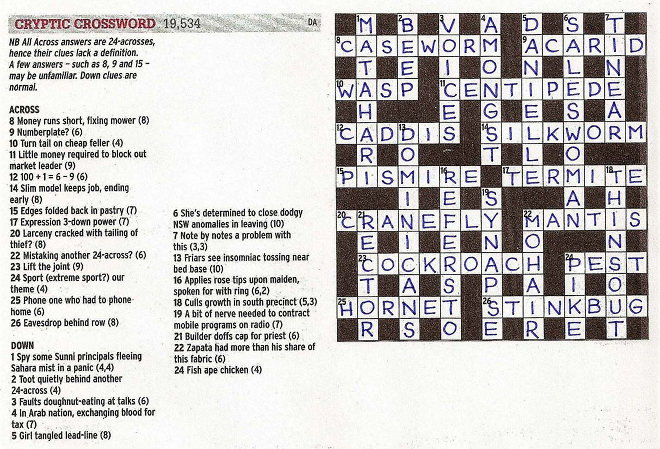 But before getting into the crossword, I have a musing that I’m puzzling over: is there a word for synonyms that are also antonyms? There are auto-antonyms, which are words that can have their own opposing meaning, such as cleave, bolt and sanction. But how about words such as up and down, which are, in the conventional sense, antonyms, but which are also synonyms, i.e. I’m up with that and I’m down with that; or I’m up for it and I’m down for it. No doubt there are many others where up and down come from, but I can’t think of anything on this mild Thursday. Lost all interest once I figured out the theme. Not sure why DA thought we’d be interested in a pest theme — a little disappointing. Lots to like this week. 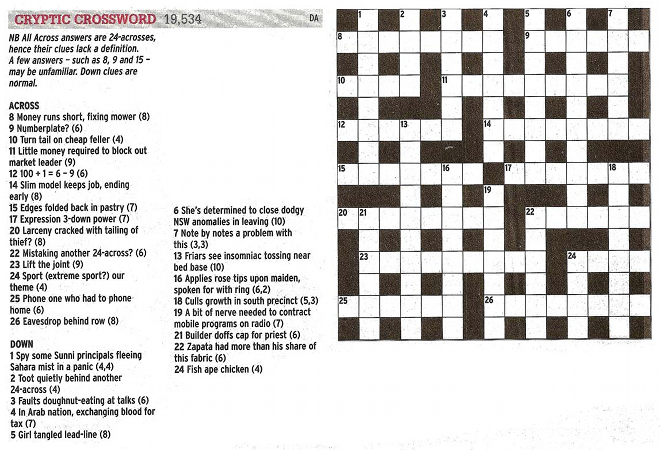 As mentioned in DA’s instructions (and therefore not spoilers) 8, 9 & 15 are indeed obscure. 8 is not in my concise Oxford. I’d heard of 15, but could not have defined it. I hadn’t heard of 12A either Rupert. A top theme. Liked 8A, 12A, 4D and simple ones like 24A and 21D! Enjoyed the theme and thought that DA was very generous with 24A and 2D. I agree with Gayle: a lot of the themed word are not 24 acrosses. I studied them at university. ‘I’m all in.’ ‘I’m all out.’ They mean the same thing. Love-all. Love-nothing. Means the same in a tennis game. Lastly…’In-law’. ‘Outlaw’. In my family, they mean the same thing. In response to DA’s search for a word for words that can be synonyms as well as antonyms, a couple of others that were mentioned in Column 8 recently are ‘in’ and ‘out’ in ‘to fill in a form’ and ‘to fill out a form’, and expressions that use the same words to express more-or-less the opposite are ‘awfully pretty’ and ‘pretty awful’. reminds me of a description of cricket where one goes out to bat and is then in. When they are dismissed they are out and have to come back in. I’ve decided I don’t like themes with obscure answers. To get the solution you have to Google or research, even if it’s just to see that the answer you have guessed from the wordplay is, in fact, one of those things that fit the theme. It’s all very well if you are an expert in the week’s theme, but not if you aren’t. But when you are a Harry Potter or AC/DC expert for example the fun is also spoilt as you can guess the answers too easily. However, when the theme is really clever like the circumnavigation one a while back (and not just a set of answers that are group of things), I’m VERY happy. Agree Jonathan, a few too many obscure ones for my liking. Make that 22D, not 21D! can someone explain to me how “fish ape chicken” equals “pest”?